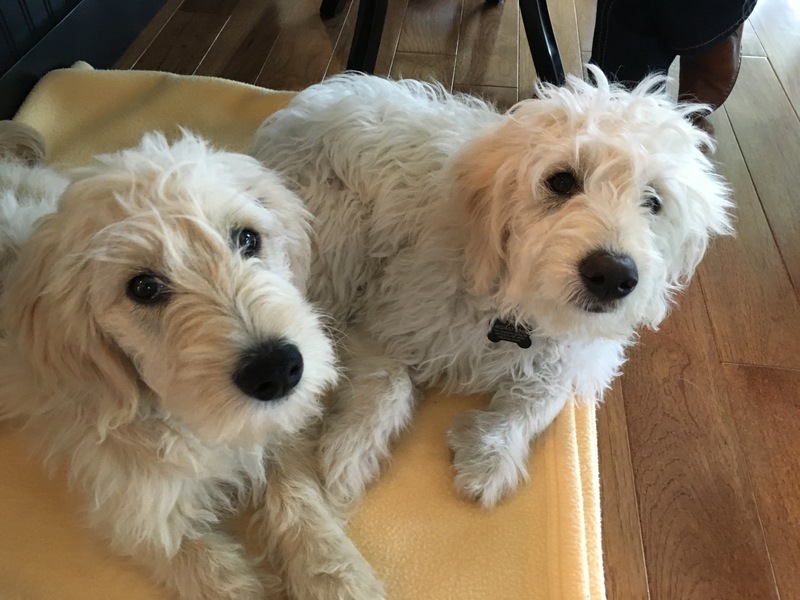 Leo (left) and Frankie are four month old Golden Doodle litter mates who were adopted by a pair of friends who work together. The dogs get to hang out in the office during the day and sometimes get a little too rambunctious for that setting; jumping up on people, playing too excitedly and occasionally urinated when over-excited. I would say that the dogs did great on the greeting because they didn’t really jump up on me, but I’m guessing that the majority of the reason for that is because they were too preoccupied with playing with one another, LOL. I sat down with the dog’s guardians to discuss what they wanted to get out of the session as well as observe the dogs. Prior to my arrival they had started digging in the dirt and mulch in the backyard and got covered in mud. As a result their guardians had given them a quick bath right before I arrived. It’s not uncommon for dogs to show an extra burst of energy right after getting a bath. I’ve seen this in puppies to adult dogs and it’s pretty common. As we watched the dogs race round the rooms chasing one another, one of the guardians objected telling me that she find it frustrating when they got over excited this way. I explained that, “the zooms’s” as this behavior is often referred to, is a pretty common behavior in puppies. A good way to decrease its frequency is to make sure that the dogs are getting plenty of exercise early in the day. I have had many clients who were able to put a stop to many of their dog problems by simply increasing the dog’s constructive exercise. While playing with one another can be a good way to let off some steam, it’s not necessarily the most constructive way for dogs to get rid of their excess energy. Don’t get me wrong, socialization is crucially important and I strongly recommended that the guardians and roll their dogs and puppy socialization classes as soon as possible. Puppy development is a time period you only get once. NEVER skip puppy socialization classes as its one of the most important things any dog guardian can dow with a pup. There’s also a lot to be said about taking your dog for a structured walk where it walks next to you. I gave the guardian’s a few pointers on teaching a dog to heal but suggested that they start practicing this inside the home. Puppies are very easily distracted so anytime you’re teaching them you want to do it in the quietest setting or environment as possible. I also went over a set of escalating consequences that I like to use to disagree with dogs whenever they are engaging in any unwanted action or behavior. I also stressed the importance of disagreeing with any unwanted action as soon as it starts. Because dogs learn through association, the timing of your correction and reward is everything. Too late and the dog can’t make the connection. While it is important to be able to disagree with the dog when it gets into trouble, it’s equally if not more important to reward the dog for engaging in what I like to refer to as desired behaviors. To help the guardians practice doing this on a daily basis, I shared a technique that I have developed called Petting with a purpose. It will be important for everyone in both dog’s homes to practice Petting with a purpose in order for it to become as effective as it can be. But this is one of the easiest things that a dog guardian can get into a habit of doing because it provides a lifetime of reinforcing a healthy leader of our dynamic. Because both of these dogs spend the day with their guardians at work where clients come and go all the time, I spent the next few minutes demonstrating how they can ask the dogs to keep a boundary away from the door on their own. This technique will come in handy when the dogs rush anyone at the door, but because clients frequently come into their office without knocking, I spent a couple of minutes teaching the guardians how to establish a verbal cue that means the dogs are to go to a dog bed across the room away from the door. Getting dogs to move to the dog bed is one thing, but keeping them there is something else. To help the guardians accomplish this, I spent the next few minutes going over the basics of teaching their dogs to stay. I will be honest in that I derived much of this technique from a dog trainer that I found on YouTube. You can find the specific dog training video here. Leo and Frankie are great little dogs who are clearly intelligent; they picked up on many of the techniques and exercises that we went through right away. It will be important for the guardians to consistently apply these techniques and communication cues as the dogs develop to help them grow into well-rounded and confident dogs.